Reviewed in Guitarist magazine, p 78, Summer 2000. Build quality: 4 of 5. Features: 3.5 of 5. Sound: 4 of 5. Value: 4 of 5. Verdict: 4 of 5. Liked the ease of use and range of "convincing amp sounds". Didn't like -- effects are limited. Unlike Guitar Player magazine, they at least mentioned how impressive the software is, rather than saying "it exists, but is not reviewed here." In the future, magazines will take the software seriously and review it thoroughly. 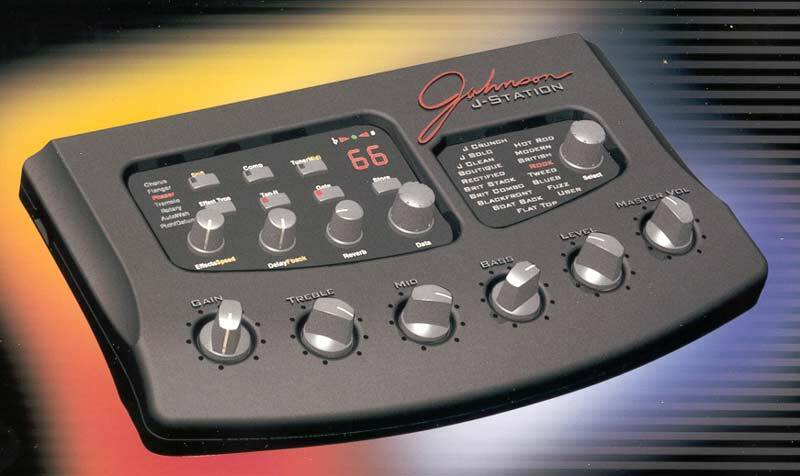 Guitar amplifier modeling, bass amp modeling, acoustic guitar simulation. Amp modeling section and effects section. 30 user locations for storing custom configurations. Compatible with J3 three-button footswitch. Includes Windows software for full parameter control of a superset of the physical controls. -- cool - I wanted that ever since the Digitech 2101. J-Station Owner's Manual (2.5 MB) - If you have trouble getting the manual through Digitech's link, use an FTP program such as CuteFTP. Go to ftp.digitech.com. Anonymous logon. Go to pdf_manuals/JStationmanual.pdf and download it. All newsgroup postings about "j-station"